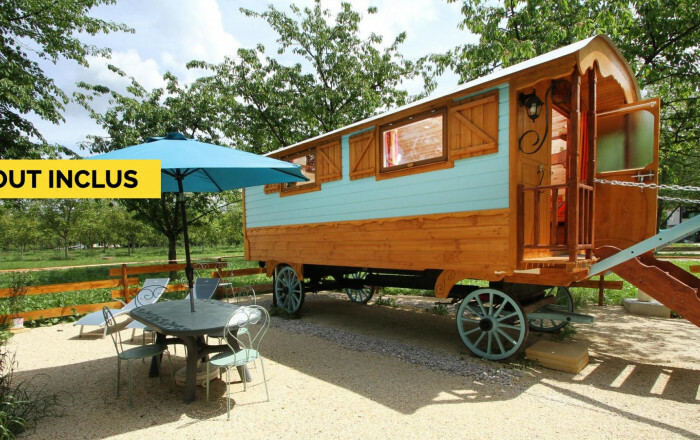 Stray off the beaten track for an overnight stay or longer holiday in this most unusual accommodation: a gypsy caravan in the Vercors-DrÃ´me. Ideally located as the departure point for excursions throughout the Royans and Vercors massif. Explore this area traditionally linked to walnut cultivation. In the Vercors Regional Nature park, this setting is sure to delight nature lovers with the many nearby walks and trips: paddle steamer at Saint-Nazaire en Royans, water museum at Pont en Royans, caves. Don't miss the Combe Laval tourist route, ski resorts - wonderful playgrounds in summer as well as winter. Lovely, spacious gypsy caravan for 2 people near family warehouse (walnut growing). Steps up to: kitchenette with bench, table, TV, double bed. Shower room/WC.